One of the most persistent and interesting themes in John Hoppenthaler’s Domestic Garden is mutability. By writing poems about this theme, Hoppenthaler has placed himself in pretty good company if, as Eliot says, a poet’s accomplishment should be placed “for contrast and comparison among the dead.” Among the famous poets concerned with mutability are William Wordsworth and Percy Shelley. So what does Hoppenthaler add to that conversation by entering it now? 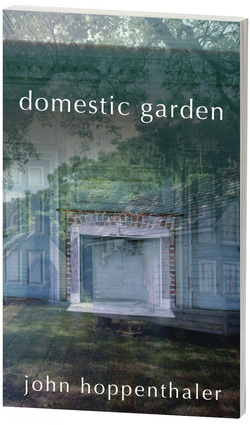 And what makes Domestic Garden such a worthy read? Mutability, like entropy, is all around us and ongoing. We experience it everywhere, but it is out of our control and challenges our understanding. Historically, we have been said to know mutability chiefly through our senses, but its cause is beyond the boundaries of sensory experience. As an apt subject for poetry, what mutability does is simple enough: it shows the natural world and those living in it in an ongoing process of dissolution, breakdown, and death. And it is pervasive. We are reminded by Wordsworth’s famous lines, “From low to high doth dissolution climb,” about the inevitable demise of the church and state. Shelley’s “Mutability” is concerned with physical dissolution: “The flower that smiles to-day / To-morrow dies.” But neither of these important writers has much of a sense of humor about it! Writing in a dramatically different time, Hoppenthaler, too, finds change to be inevitable in the politics of our time and in our understandings of the human body. But in the contemporary context, he necessarily begins where Wordsworth and Shelley leave off and adds to their deterministic views of mutability an element of irony and even whimsy that sustain the characters in his poems. His garden is natural and political, but it is also, importantly, domestic: in the failings of human relationships, what can be salvaged can only be redeemed by our willingness to employ our imaginings in an effort to heal our differences. Even in these hard times, we receive proper recompense, as Wordsworth might say, in meaningful relationships and can find our way back to the most fundamental parts of our lives. It is in this hopeful realization that Hoppenthaler separates himself from his peers and demonstrates the longstanding dilemma of how to reconcile the world of our senses with the world that exists out of sight and just beyond our reach. It provides a kind of strange miracle, a fully satisfying life that is still possible on this planet, in Hoppenthaler’s view of it. In a sense, Hoppenthaler’s hope places us, when the book begins, at the beginning of all time, looking forward. In the very next poem, “camp out,” physical limitations create boundaries around what is mortally possible as we are able to perceive the world with our senses, “ghost stories / so honest and cruel even the bigger boys will begin to cry.” In a world thus fallen, we are forced to return to the source of all things, the domestic garden, for redemption: “It will be their mother who haunts them. How badly / they’ll miss her and want to go home." It is ironic, of course, that we are the source of the very narratives that scare us the most, even though they are “honest.” If we believe that consciousness has evolved independent of the body that encases it, we might see this as a very real stage in the evolution of consciousness, in the growth of a modern mode of perception. This view of the history of mutability stands apart from the better-known perspectives of Wordsworth and Shelley, who had a different purpose in mind and a different view of human potential. The irony of our making myths to scare ourselves is part of the message, of course. and, yes, I’ve got on John Denver, almost heaven. in an earnest way, the world filled with song. with divine purpose, nearly their hour. In his title poem, which serves as a kind of epigraph to the collection, Hoppenthaler employs a similar juxtaposition to place misarranged flowers alongside an unnamed other who is absent, though not really: “you aren’t really gone, except in the way/presence sometimes contradicts itself." This powerful statement, coming as it does as our first encounter with the volume, sets up a series of poems in which gaps in our experiences—including what we can know through our senses and what we cannot—are reconciled through acts of imagining. Later in the book, in "the way to a man's heart," Hoppenthaler asks, quite appropriately in this context, “and who is it / who says poetry makes nothing happen?” The act of imagining makes everything possible: “I could spin / that scene . . . / into imagination, all / possibility . . . ” Imagination in this volume is redemptive. Its natural products are irony and whimsy. The fallen world as it is portrayed in Domestic Garden is best characterized as a world of contradictions, uncertainties, indeterminacies. At the core of Hoppenthaler’s ethic is the effort to find the self’s fulfillment in a reconciliation of opposites. An excellent example of this turn in consciousness from the inside to outside is “Vacation,” where the poet is most transparent. He situates himself as poet and man: “I don’t want life / to open out; / I want it to open / in.” What’s outside “is obedient confusion,” insofar as events we might find upsetting occur nonetheless in predictable ways, making us believe life is indeed predictable, even if fear-provoking. But all needed adjustment is internal, “sifting what’s been thrown / together in our hollow / bodies.” Any adjustment we are capable of making requires an act of cognition, an imagining of things reconciled and harmonious. That thought leads directly to the underlying theme in the excellent “eminent domain.” The world thus created by Hoppenthaler is dichotomous: the garden in Eden and the one outside it, which are parallel to the world of sensory experience and the world(s) beyond that experience. “eminent domain” shows this dichotomy at work, bringing to mind the Wordsworthian “correspondent breeze.” The narrator of this poem, like narrators of many other poems in this collection, shares his experience with an unnamed other. This strategy gives the poet room to speak and think, both. We could end up in their bellies. Fittingly, in the ongoing context of fear and potential dissolution, these two children note that “Evening grew uneasy” and “Mother agitated the rusty triangle.” The Edenic setting becomes a place of worry and distress. They choose to return to the other side together, the figurative Eden. But by now they have lost innocence and understand their danger. The fence they easily crawled under now has changed to accommodate their new knowledge. We crawled back through the opening in the fence. It was barely wide enough that we were still able. The little people could have followed, had they wished. In the hopeful world of Domestic Garden, it is possible to return to Eden, but with some effort. For Hoppenthaler, reconciliation of the known with the unknown requires love, as it does in Shelley’s most hopeful works, for instance. It is no surprise that many of the poems of consummation are ones in which he, his wife, and his stepson transcend boundaries placed around them by the world they inhabit and exist unharmed in the domestic garden of their making. In the poem “deciding to marry,” the decision to get married is an easy one to make, demonstrating Hoppenthaler’s humor and sense of the ironic that enables him to reconcile himself with another: “It became so obvious: / you at the top of the lighthouse stairs, the red dress." In this, as in other actions taken in a world that constantly threatens our extinction, any decision requires strength: “I summon my last nerve,” we find out in “waterfall two,” “and cross / over." For all of this book’s complexity, resolution seems to come easily to the committed few. For Hoppenthaler, reconciliation of the known with the unknown constitutes love and commitment, both of which come to us in these poems in acts of deep imagining. Hoppenthaler seems to record these acts of imagining as they happen, not after the fact of an occurrence. By understanding this much about human distress and survival, Hoppenthaler can show his readers how to accept the inevitable dissolution with grace and to see life’s ironies in it. Domestic Garden makes a reader think and feel and smile. That’s a lot for one book to do. Unless it is a very good book. Eliot, T. S. “Tradition and the Individual Talent.” The Norton Anthology: Theory and Criticism. Vincent B. Leitch, Ed. NY: Norton, 2001. 1093. Shelley, Percy. “Mutability.” English Romantic Writers. David Perkins, Ed. NY: Harcourt, 1967. Domestic Garden, by John Hoppenthaler. Carnegie Mellon University Press, 2015.